I'm very iffy about mushrooms, but this is another recipe that's increasing my fondness for them. 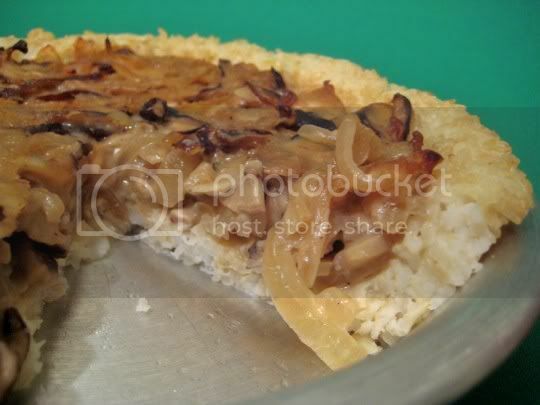 I don't think this is so much like a tart, but more like a hearty mushroom and rice casserole. One reason is that the crust isn't dough, but a simple mixture of cooked brown rice (well, I used half brown and half white) and egg whites. Mix together, press into a pan, and bake until firm. The filling consists of sauteed (in butter, not oil) onions, mushrooms (button and shiitake), and fresh rosemary and thyme. Next, butter, flour, and milk are cooked together to create a roux, and this is added to the mushroom mixture. And then the glorious cheese! The recipe suggests manchego, but I used Iberico (a good subsitute) which was salty and pungent. Spread the filling into the rice crust, and bake until golden. It's salty, sweet, and savory; and the texture is crunchy, firm, and creamy. The saltiness of the cheese is a great complement to the earthy mushrooms and the sweetness that's brought out from the onions, and of course there's that great herbal woodsy note of the rosemary and thyme. Make again? Yes. Who doesn't like a nice hearty, cheesy casserole?